Prairie strips are composed of native perennial plants and located across hillslopes. The stiff stems and abundant, fibrous roots of the native plants slow down water and allow it to soak into the soil, causing less soil erosion. Photo courtesy of Lynn Betts. 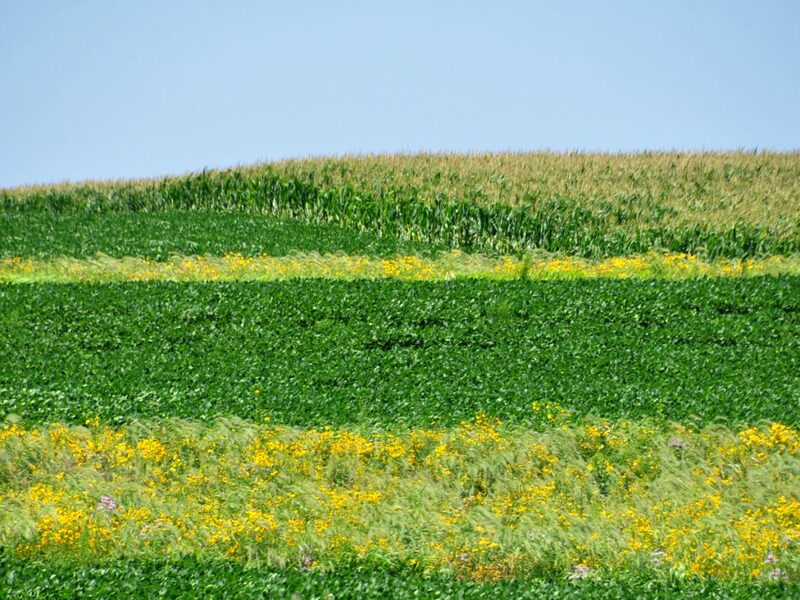 Prairie strips have the ability to change the negative effects monoculture fields have on soil, nutrients, groundwater, pollinators, wildlife diversity and habitat. A prairie strip is much what it sounds like: a strip of diverse herbaceous vegetation running through a farm’s rowcrops. In the American Midwest, chances are the soil that now supports crops was once covered in prairie before cultivation. Prairie plants are a mixture of native grasses, wildflowers, and other stiff-stemmed plants. They have deep roots that draw water and nutrients from far below the surface. They are perennials, returning to grow each spring. reduces the loss of two key nutrients (nitrogen and phosphorus) from the soil by nearly 70 per cent and 77 per cent, respectively. It also leads to greater abundance and diversity of beneficial insects, pollinators such as bees and monarch butterflies, and birds. Going from zero to 10 per cent prairie provided far more than a 10 per cent increase in the measured benefits. “Some of these benefits can impact our pocketbooks but are not accounted for by typical financial markets,” said Schulte Moore. These include ecological benefits such as flood control, cleaner water, and carbon from the atmosphere stored. Market benefits also exist: more productive soil in the fields can, in time, translate into better yields, fiber and honey production, forage for livestock, and hunting leases. The STRIPS research began in Iowa in 2007. Because of promising scientific results, five years later the researchers began working with farmers to introduce prairie strips onto commercial farms. While the research results have been more variable in these more complicated settings, the findings are encouraging and cooperating farmers are liking what they see. The plantings require a modest investment in site preparation and seed planting. Maintenance tasks include some mowing in the establishment years and spot treatment for weeds. So far, the researchers have not seen competition between the prairie plants and crops that impact yield. Still, lack of stable financial rewards for establishing and maintaining prairie strips is a barrier to widespread adoption. “Finding ways to return economic value to farmers and farmland owners is crucial,” Schulte Moore said. She is now focused on developing marketable products from prairie strips, such as renewable energy sources from prairie biomass. That would help make what is already a solid investment into a can’t-lose proposition. Schulte Moore presented this research at the November meeting of the American Society of Agronomy and Crop Science Society of America in Baltimore, MD. This research has been funded by a consortium of funders; a full list can be found here.